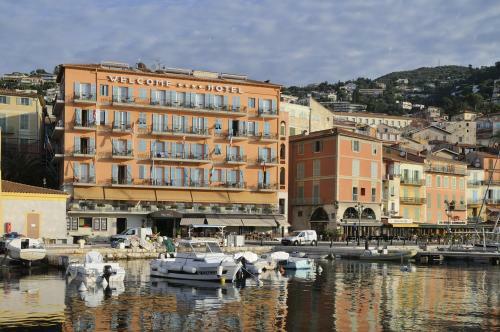 Located only 30 minutes by car from Nice International Airport and 20 minutes from Monaco, Hotel Le Provencal offers a comfortable accommodation on the French Riviera, in the city center of Villefranche-sur-Mer. Facing the famous bay and overlooking the citadel, this charming hotel features a quick access to the nearby beaches and marina of Villefranche-sur-Mer, and represents thus an ideal solution to enjoy summer activities on the banks of the Mediterranean sea. Thanks to a peaceful shaded terrace and garden, this air-conditioned accommodation in the South of France is also well-adapted to guests wishing to relax within a typical Provençal environment. With a friendly atmosphere and modern facilities, Hotel Le Provencal in Villefranche-sur-Mer is the perfect destination for tourists looking for a quality stay in a popular seaside resort of the French Riviera.